Those of you who are regular readers might see a pattern with the most recent series of Meatless Monday recipes. I will admit that I love soup and when you’re not a vegetarian, but you’re cooking vegetarian, it seems to reoccur as the easiest way to make something satisfying without relying on our feathered or furred friends. 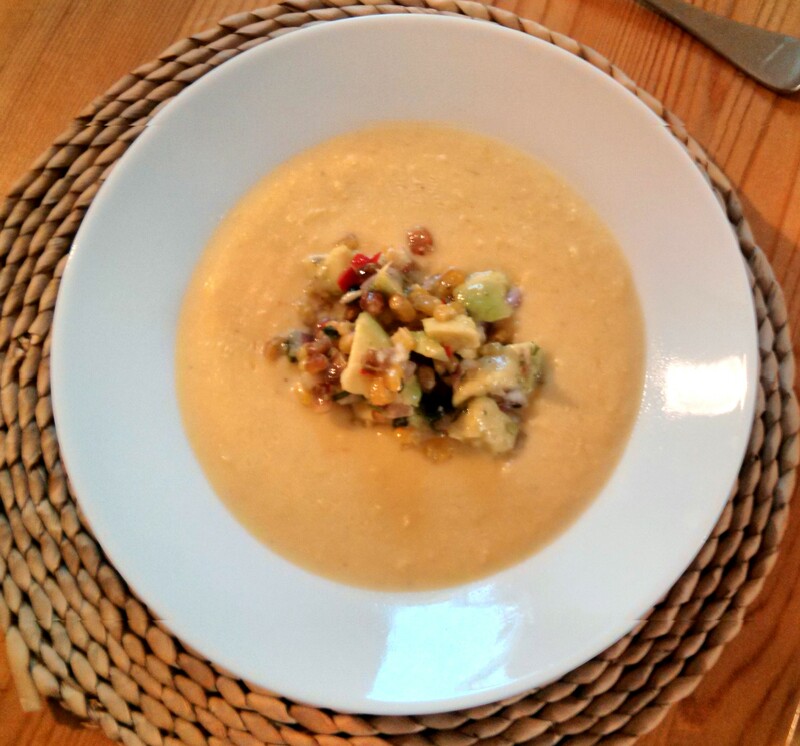 This is a fantastic summer soup, using sweet corn at its sweetest and most perfect. However, you can make this soup any time of year because it works just as well with frozen corn. It’s velvety and thick, something you can really get your teeth into − unfortunately it got into our teeth a little too much and I had to pass around some toothpicks afterwards. If you don’t mind having a few roasted corn kernels stuck between your teeth − and I can’t say I honestly did mind because when something is this tasty, I’ll put up with most manner of inconvenience − then it’s a really easy and impressive soup. The roasted corn salsa is what makes it though, otherwise it would just be blended corn in a bowl. Something else I haven’t managed to get onto the blog yet this summer is a roasted corn salad, a sort of deconstructed version of Mexican street corn on the cob with queso fresco, which is absolutely delicious. This follows the same method of caramelizing the corn and it creates this crunchy, yet still juicy, sticky corn which just contrasts so beautifully with the velvety soup − this is also the bit that gets stuck in your teeth, but I really don’t think you could leave it out. 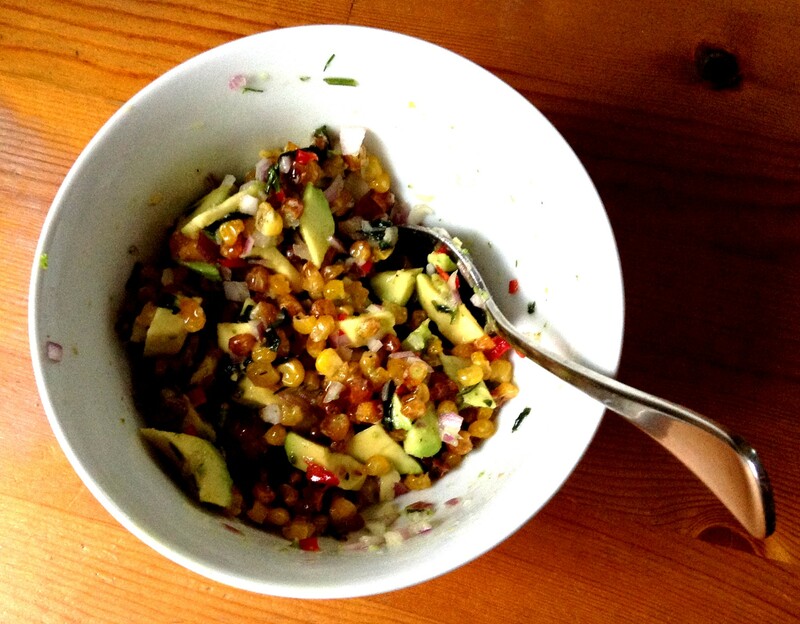 Crunchy corn, soft avocado, fiery chilli, fresh coriander, the bite of red onion and the tang of fresh lime juice. All of this freshness just lifts the sweet corn and milk mixture and makes every mouthful exciting and ‘Mmm’-inducing. Don’t think about this one, just make it. 2. Place corn kernels for salsa on a baking sheet and drizzle with olive oil and season with salt and pepper. Place in the oven and roast for about 15 minutes, or until browned and crunchy in places. 3. Remove from the oven and set aside to cool. When cool mix together all ingredients for salsa and set aside. This can be made up to 2 hours ahead. 1. 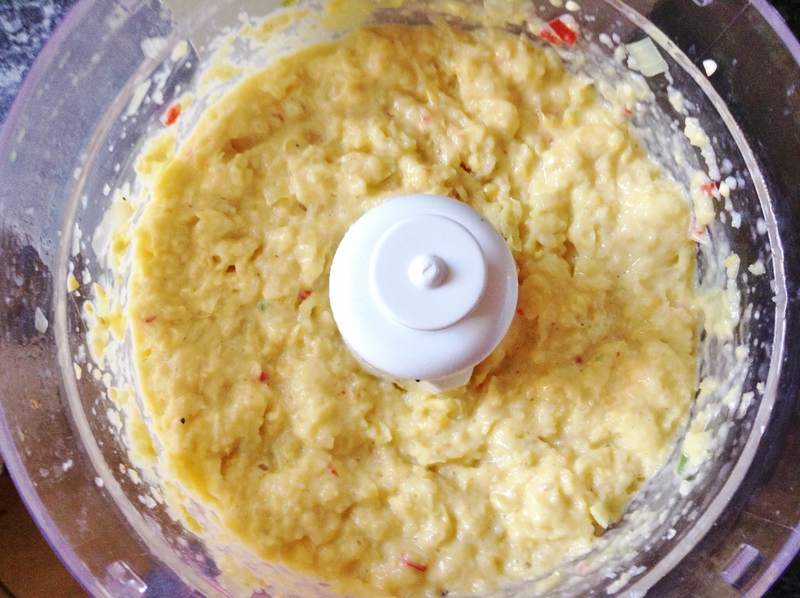 In a blender or food processor, place the corn kernels for the soup. 2. In a large pot, cook the onion, garlic and jalapeño in the oil over medium heat until softened, about 5-10 minutes. 3. Add the onion, garlic and jalapeño to the corn kernels in the blender or food processor and purée until smooth. This may take a while and you may have to scrape down the sides periodically, but don’t add any more liquid. You will end up with quite a thick mixture. 4. Add corn mixture back to pot and cook over medium heat for a few minutes until it starts to thicken, stirring constantly so it doesn’t stick to the bottom of the pan. 5. Slowly whisk in the vegetable stock and milk and simmer for 15-20 minutes. Taste for seasoning. 6. Serve soup with a generous spoonful of the salsa in the center of each bowl and plenty of toothpicks to hand! Looks delicious. As you say, it reminds me of buying elote hot from a street stand in Juárez. Yum. I forgot that I added about 1 teaspoon of cumin and some smoked paprika to the corn mixture as well! Very important! Nice use of fresh corn! It kind of has a Mexican flair with the avocados and cilantro. Well, Mexicans do love their corn! I love my corn! (& Mexican flavors) This soup looks DELICIOUS! !